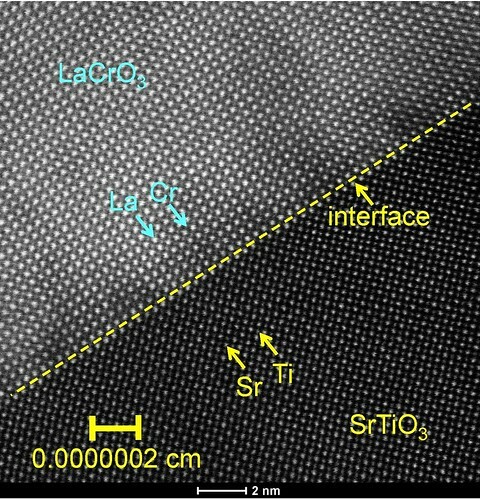 A cross-sectional scanning transmission electron micrograph of the interface between the polar lanthanum chromium oxide (LaCrO3) and the nonpolar strontium titanium oxide (SrTiO3). Although the interface appears to be atomically abrupt, detailed spectroscopic measurements show that cation mixing occurs in the interfacial region. RICHLAND, Wash. — To improve the electronic devices that keep our modern, hyper-connected world organized, scientists are on the hunt for new semiconductor materials, which control the flow of electricity that powers smart phones and other electronic devices. One answer could lie with an unusual form of electrical conductivity that takes place at the junction of two oxides, materials made of oxygen and metal. When an oxide made up of alternating positively and negatively charged layers — called polar — is placed in direct contact with a nonpolar oxide, the interface between the two can conduct electricity in a way that could make some novel electronic devices possible. But a group of scientists were recently surprised to find the interface of two particular complex oxides — the polar lanthanum chromium oxide, LaCrO3, and the nonpolar strontium titanium oxide, SrTiO3 — did not conduct electricity. The scientists — from the Department of Energy's Pacific Northwest National Laboratory and the University College London in Britain — give a possible explanation for this unexpected result in a paper published in the Nov. 11 issue of Physical Review Letters. Their hypothesis challenges the reasoning that many use to explain conductivity at the interface of complex oxides. "To create the next generation of electronic technologies that society needs to progress, a replacement for silicon will be needed," said PNNL Laboratory Fellow Scott Chambers, the paper's lead author. "Our research sheds light on why conduction may or may not occur in one candidate, complex oxides." The leading explanation on why electrical conduction — the movement of electrons within a material — occurs at the interface of polar and nonpolar oxides is called electronic reconstruction. This theory states that voltage builds up with each atomic layer in the polar material. This results in the polar oxide becoming electrically unstable. After the voltage builds up in a certain number of layers, some electrons are thought to flow from the polar oxide to the nonpolar oxide. This stabilizes the system and creates a conducting layer in the nonpolar oxide near the interface. Many scientists consider electronic reconstruction a universal phenomenon that creates conductivity wherever polar and nonpolar oxides intersect. If that were the case, Chambers and his co-authors should have seen electrical conduction at the junction of LaCrO3 and SrTiO3. But when they placed metal pads in contact with the junction and tried to run electrical current along the interface, they found the interface was insulating instead of conductive. They did, however, find conduction while researching a similar composite for a previous study. The only difference between the two materials was that the previously studied composite contained aluminum instead of chromium. The key, the research team proposes, is how you explain conductivity at polar-nonpolar interfaces. Electronic reconstruction assumes that precise, clear-cut regions exist for each oxide material, without any blending between the two. Chambers and his co-authors suggest that it's not that simple. Instead, they propose that atoms at the interface mix and rearrange when the junction is formed. The team believes that atoms diffuse from the polar oxide, across the interface and trade places with atoms in the first few layers of the nonpolar oxide. In the case of the material that the team did find to be conductive, Chambers and his colleagues determined experimentally that lanthanum and aluminum ions from the polar LaAlO3 replace strontium and titanium ions in the nonpolar SrTiO3 in unequal proportions. Since a lanthanum ion has one more electron in its outer shell than a strontium ion, lanthanum's movement gives the nonpolar side of the interface an extra electron. This can create conduction if the electron is free to move through along the interface. On the other hand, an aluminum ion has one less electron in its outer shell than a titanium ion. So when an aluminum ion moves over, that site on the nonpolar side is then short an electron. If lanthanum and aluminum displace strontium and titanium in equal proportions, there wouldn't be any conductivity. But if more lanthanum than aluminum enters the nonpolar SrTiO3, there is a net excess of electrons, which can lead to conduction. Chambers and his co-authors propose that the latter is what happened in their previous research. But in the case of their new research on LaCrO3 and SrTiO3, the team concluded that lanthanum and chromium crossed over to the nonpolar side in equal amounts, making conduction impossible. The electronic structure of the chromium ion is also different enough from the aluminum ion that internal charge rearrangement can occur in LaCrO3, but not in LaAlO3.This can also stabilize the system, particularly when electrons from chromium interact with titanium that has moved into LaCrO3, making an electronic reconstruction unnecessary. "These results suggest that the popular electronic reconstruction model is too simplistic to be as universal is it is claimed to be," Chambers said. "Interfaces of polar and nonpolar oxides are extraordinarily complex and they defy simplistic explanations. However, with sufficiently detailed understanding of their properties, this phenomenon can be understood, and may be useful for some novel electronic applications that cannot be done with conventional semiconductors such as silicon." The team acknowledges that proving their hypothesis will be a challenge, as that would require knowing where all the atoms are near the interface. However, with advanced materials characterization techniques at PNNL and elsewhere, they plan to determine the interface structure with enough accuracy and completeness to develop an atomistic model of conduction — or lack thereof. The experimental work for this research was conducted in the oxide epitaxy lab that Chambers oversees at EMSL, DOE's Environmental Molecular Sciences Laboratory user facility at PNNL. This work was supported by DOE's Office of Science and the Royal Society.